Binatone Elite cordless phones all run on rechargeable 1.2V AAA batteries. 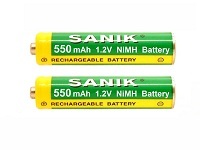 It is perfectly normal for these batteries to lose their ability to hold a charge over time. When you notice a reduction in the time that your phone works between recharges ie. it does not last for long in conversation, beeps at you or has bad reception, it is probably time to buy new replacement Binatone Elite cordless phone batteries. In this section you will find the correct rechargeable battery packs and batteries for your Binatone Elite cordless phone.